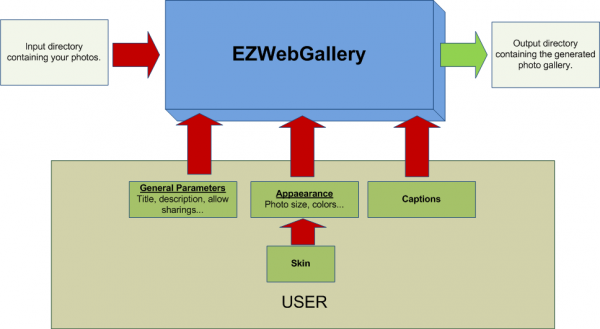 Given an input folder containing your photos and a set of parameters, EZWebGallery generates a file tree forming an autonomous and fully functional web gallery. Optionally, the photos can be reordered and captioned. A skin can also be applied in order and personalize the gallery’s appearance. Basic principle of the gallery generation. Note: The photo gallery obtained after generation lies on your local hard drive. It is up to the user to upload it on a web server, using an FTP client. Configuration: allows to set-up the main general parameters. Some of them are mandatory prior to the generation process, such as the input directory, the output directory, the title of the gallery… Others are purely optional. Appearance: allows to set-up the appearance of the gallery. Displayed photos size, the number of thumbnails on the navigation screen, watermarking… This is also from this tab that the user can apply an existing skin or choose to create a new one. These skins are an easy way to configure the aesthetics of the gallery: fonts, colors, border sizes, and so on. 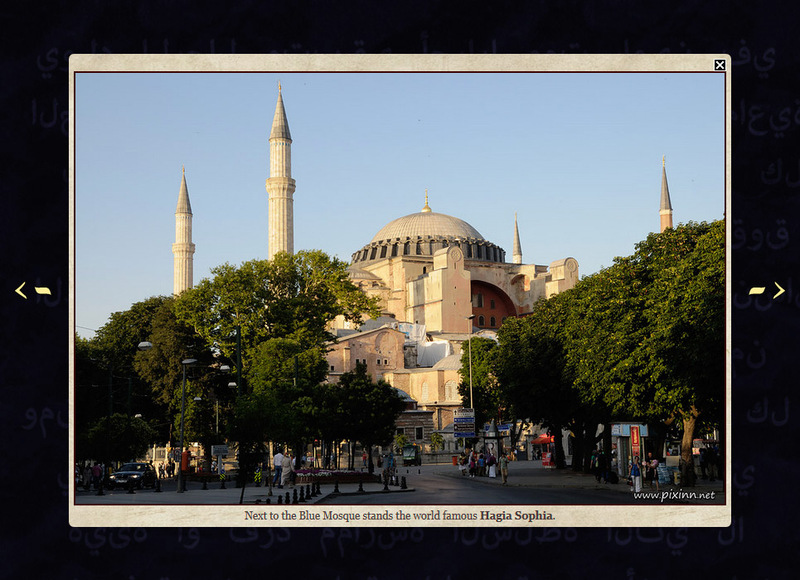 Photos and Captions: from this tab, man can add an optional caption to each photo and reorder them. Once satisfied with the various parameters, click on “Generate”. If the input folder contains numerous photos, the first generation can take some time. But following generations may be achieved far more quickly, if the parameters concerning the quality or the size of the photos and the disposition of the thumbnails are left unmodified. 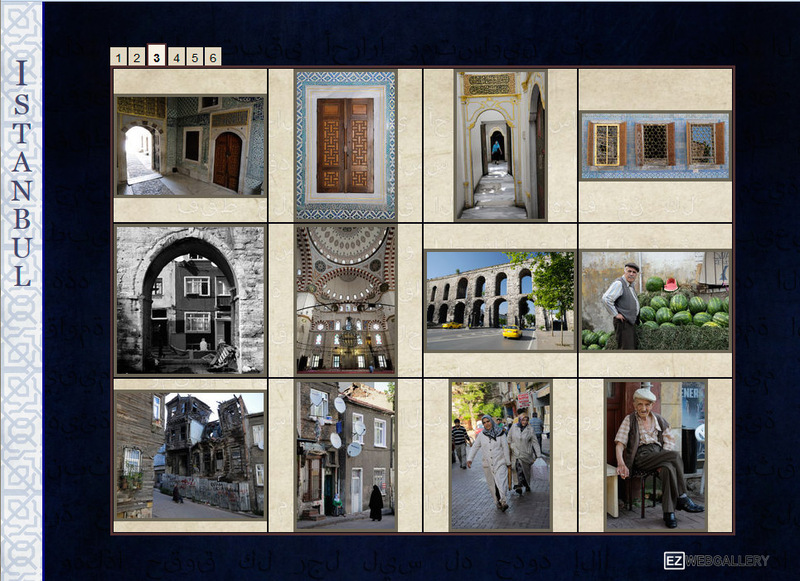 Index screen shows a table of thumbnails used to navigate and choose a particular photo to display. The table size depends on parameters set up in the Appearance tab and the skin applied. Photo screen displays the required photo and its associated caption, trying to use the available screen space as efficiently as possible. Buttons allows to display the next or previous photo, or to go back to the navigation screen. This can also be achieved using the arrows on the keyboard. A photo displayed with its associated caption. For detailed information, please refer to the Appearance tab documentation.